There are three easy steps to transform a division problem into a multiplication problem. All we need to remember is COPY - CHANGE - FLIP, or as we like to call it at GradeA, the CCF. COPY the first fraction exactly how it is. 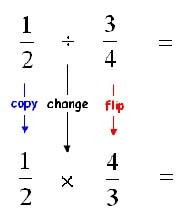 FLIP the second fraction. The top becomes the bottom and the bottom becomes the top. which will of course reduce to . Most teachers will want you to reduce your fractions to the lowest term possible. So in order for you to get full credit, make sure you always check your answer to see if it could be reduced further so you don't lose any points. You worked hard for those points--make sure you get them all! Do you now see how to divide fractions? One helpful hint is to remember that when you are multiplying and dividing fractions you do NOT need a common denominator like you do when you add and subtract fractions. You can discover other helpful tips by visiting the other rules of fractions page or return to the Grade A homepage for more great math help. Like how GradeA teaches fractions? You may also enjoy our free preAlgebra help page - dedicated to helping you be better prepared for algebra class. Math properties, inequalities, exponents, perfect squares, math clue words, the math order of operations and so much more!